As focussed as I am on finding perfect accommodation for a family holiday, I am equally passionate about what I want to do while away. I believe a holiday should be an educational experience – especially for my children. 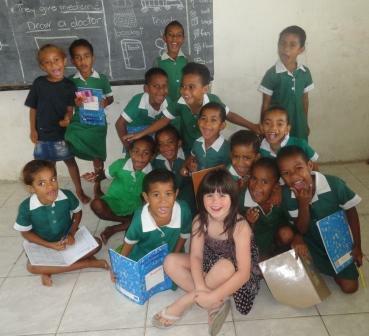 On our recent holiday to Fiji, visiting a local school was on my bucket list. I wanted my children, aged 7 and 9, to see a school and understand how fortunate they are. Luckily, I had read somewhere that it was a nice gesture to take some small items to donate during your visit. It is this advice that I now pass to you. I am so glad I sat down with my daughter, going through her drawers and pencil cases to sort out a bag full of items to take with us – pencils, textas, erasers and even a small pair of scissors. I must admit a felt a bit embarrassed giving them to the grade one teacher – I handed them over, smiled as the teacher thanked me, before turning away. It was then that others saw the teacher had tears in her eyes. I know now there was no need for me to be embarrassed. I was not being patronising in handing over these items. I had genuinely made this teacher – and I am sure her students – very happy. It was now I wish I had brought more. Why had I not thought of notebooks? Photocopy paper? Simple things that can make such a difference. Why did I not think to buy some other items that would make someone’s day – hair clips, lip gloss. All the things my daughter takes for granted – and has too much of. My daughter with students from Malolo District School’s Grade 1 class. Unfortunately, I had not thought of this, so when we visited a second school in a mountain village, I had no more to give. Luckily the tour organisers had biscuits for us to buy, and I had grabbed all the small toiletries from the hotel room, the shampoo, conditioner, moisturiser and soap. I gave these out to young girls, but the most heartening moment came when I pulled out a lip gloss for an older woman from the village. A beautiful pink Elizabeth Arden lip gloss I had got at the airport duty free on my way over. I know she was touched to receive this small gift. I told her she would be the prettiest lady in the village. She grabbed both my hands and squeezed them. The smile she gave was her gift to me. So next time you are packing for a holiday to Fiji – or any country less fortunate than your own – please throw in some basic stationary items for local school children, as well as some small gifts that will make such a big difference in someone’s life. Have you had a similar experience while on holidays? I would love to know.